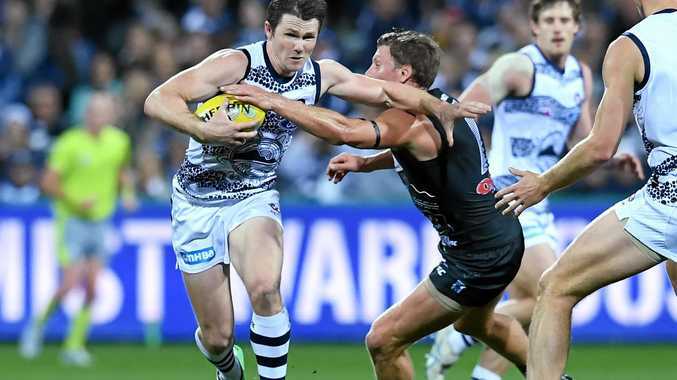 GEELONG coach Chris Scott said he feels like a broken record speaking glowingly of star duo Patrick Dangerfield and Joel Selwood after the pair led the Cats to another win on Thursday night. Dangerfield kicked three goals including the match-winner with 1:38 minutes left, while Selwood was best afield with 33 disposals including 19 contested. The Cats looked almost certain to lose but Port Adelaide squandered multiple shots on goal in the dying stages before Dangerfield - sandwiched between two Power players - snapped his third goal of the night on his left foot around Darcy Byrne-Jones just meters from the goal line. The Cats were able to hold on to the two-point lead they established from that major in the final seconds despite two promising forward thrusts from the Power. Scott dismissed suggestions his side got out of jail after the game but did admit an "overriding emotion" of relief. "It's always a relief when you win," Scott said. "I feel relieved when you win by 10 goals and I feel 10 (times) relieved when you win by two points when it looked for all intensive purposes like we were going to lose it late. "With three minutes to go I think they would have been the favourite ... but I think it would be unfair to say we stole it." Dangerfield had nine disposals and five tackles in the final term to go with his goal while Selwood had 10 final-quarter touches, six contested. "When the game's on the line and Selwood flicks it out to Dangerfield, you're in good hands," Scott said of Dangerfield's match-winning goal. "It's such an asset as a coaching group to have players like that you can look in the eye at three-quarter time and know they're going to deliver." The Cats sustained two minor injuries out of the match. Harry Taylor came off with a poke in the eye in the final term while Jed Bews suffered a corked thigh but Scott said there was "nothing significant to suggest he's in doubt for next week".